I know a few weeks have passed since Molly’s cupcake party. But I was looking through the photos and realized that I haven’t posted about how to make the cupcake liner flowers. Well I have to be honest I didn’t actually make them my gorgeous niece did. As it was a last-minute idea I used whatever supplies I had at home. Ideally I would have used green pipe cleaners for the stems but I didn’t seem to have enough so I used vintage straws to cover the colour of the pipe cleaners. This worked perfectly! All you need to make the flowers are … cupcake liners, buttons, pipe cleaners and something to poke a hole in the cupcake papers we used the Creative Memories Quail. Using the pipe cleaners thread a button through the button holes and twist the end to secure button. Choose two different sized cup cake liners. Turn them inside out. So the pattern is on the inside. Cut a small hole into the centre of the cup cake liners. Thread the pipe cleaner through so the button becomes the centre of the flower. 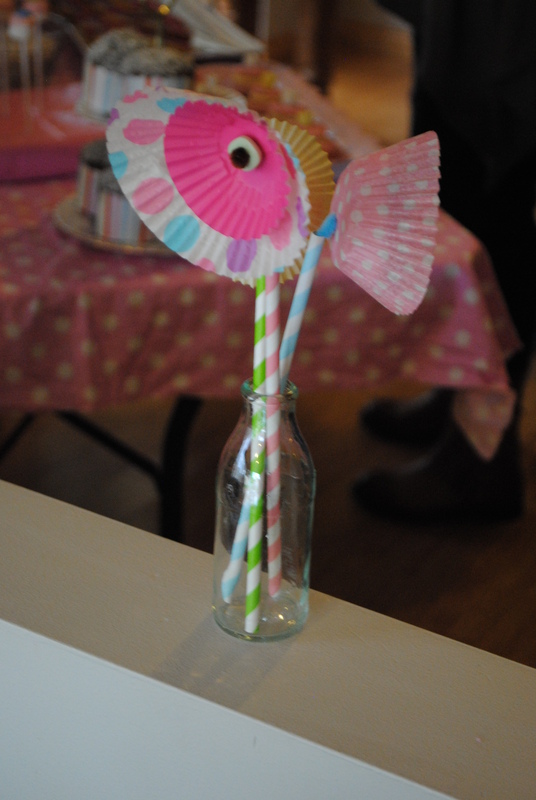 Place the pipe cleaner into a vintage straw and display a small posy onto a glass bottle, vase or jar. I came across another blog called Sweet Simple Stuff and she had her own twist on how to make these flowers.